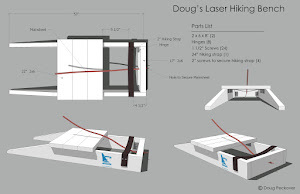 We had a local Laser event last weekend and something interesting happened in one of the races. I was on a run chasing a really fast, talented 17-year old sailor who was just in front. Each time I tried to go left he defended by going further. With the rest of the fleet catching us, I decided to go to his right and we pulled even. 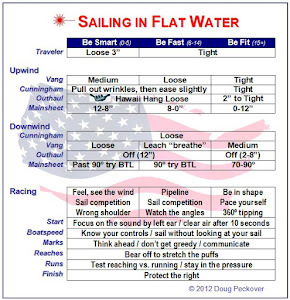 Then, about 20 boat lengths from the mark, I slowly pulled in my main sheet to slow down. The plan was to have him edge ahead and then dig in quickly five boat lengths from the mark, get inside, and get buoy room. But the plan did not work because he saw me pulling my main sheet and said "that's something I've never seen before" and pulled in his main sheet to also slow down. Hence, this blog post. With all of the emphasis in our sport with going faster, why would anyone want to actually slow down? Not very subtle, but there are definitely times you want to slow down. In fact, in the last race I made a bonehead mistake that was very costly. Sure enough, we're headed and I cannot make the mark. So, what do I do? 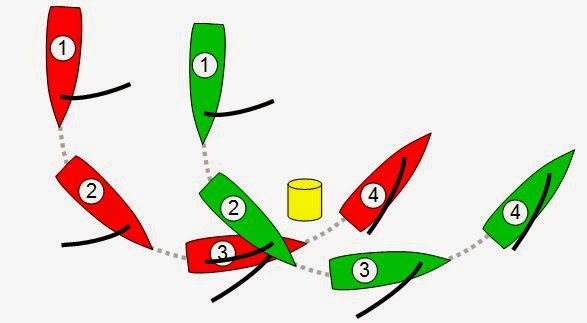 I jibe around, get enough speed to tack inside the next boat on the layline, fouled him, and then had to do my circles. Pretty stupid, but I was still ahead of the quick teenager. But in doing my circles, I tipped, had trouble getting up again, and found myself in last place. I should have slowed and stopped by pushing out my boom. After the two passed, I could have put in two quick tacks and rounded in third place. But to do this, I had to realize earlier that making the mark was a low percentage move. Sailing more conservatively is much better than hoping that things would somehow work out. I got greedy, which rarely works with mark roundings, and it cost me the event. 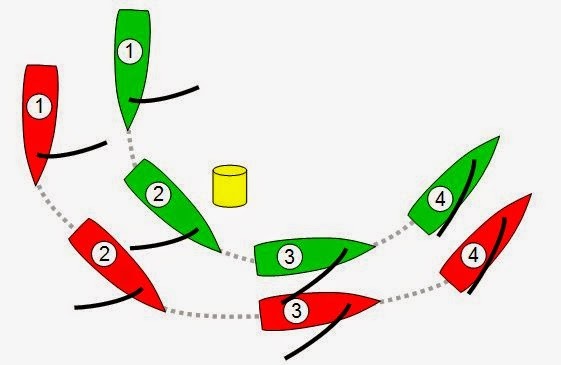 Green cannot do this within three boat lengths because it has to make a seaworthy rounding. But anticipating red's move further away gives green a safe rounding, and then the option of tacking if it wants or just continuing to cover red. Slowing down is counterintuitive and definitely works when you need it. In the first and third above examples, it works best when you disguise what you're doing - something that Manfred Curry clearly did not do! Wow, I can't believe you wrote about this because it happened to me a few months ago. 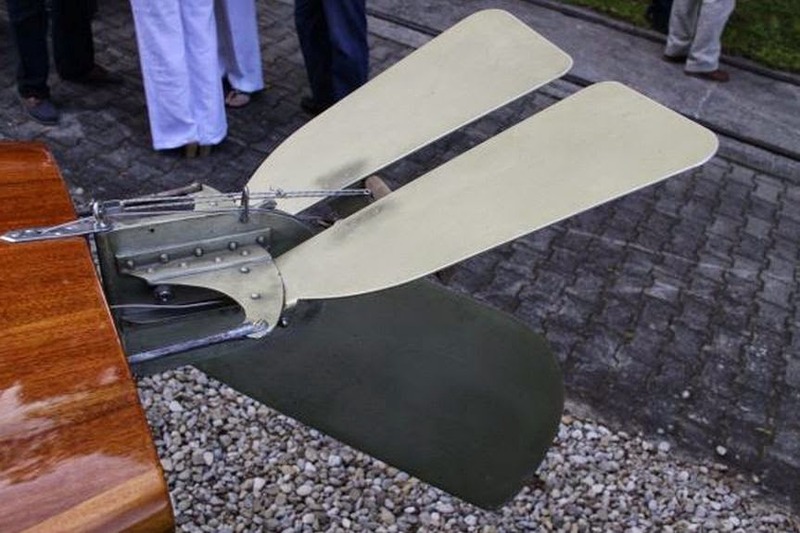 Did what you did, except capsize, but still lost a motza. At least 10 positions. So much to think about for my Gerry brain! There are other ways to slow down. Think of fast sailing and do the opposite: sit at the back to dig the transom in, back the sail by pushing it out, heel the boat...etc. As you say it is not often needed but when it is (like a mark rounding jam in a big fleet) it can save you from doing turns or give an advantage as Doug describes. Something to practice? 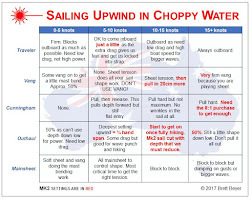 Slowing down is something we never practice but should - like doing 720's and capsizing. This would make an interesting drill: start on a run, slow down and stop, then do a 720, then capsize and get going again. That sounds like my last race. Are you sure that you cannot slow down AND do a seaworthy rounding. You are not doing any different course, only the speed at which you progress through that course is slower at the start. You are still sailing your proper course and are not doing a different "tactical" course. Interesting. Hmmmm, I don't think I'd want to explain that to a jury. The way I've done this rounding is slowing down earlier to force the other boat to commit, and then rounding the mark as quickly as possible. Holly Crap! I'm In Front... Now What?